This weekend I had the pleasure of hosting a San Antonio Beer Club meetup at my house. 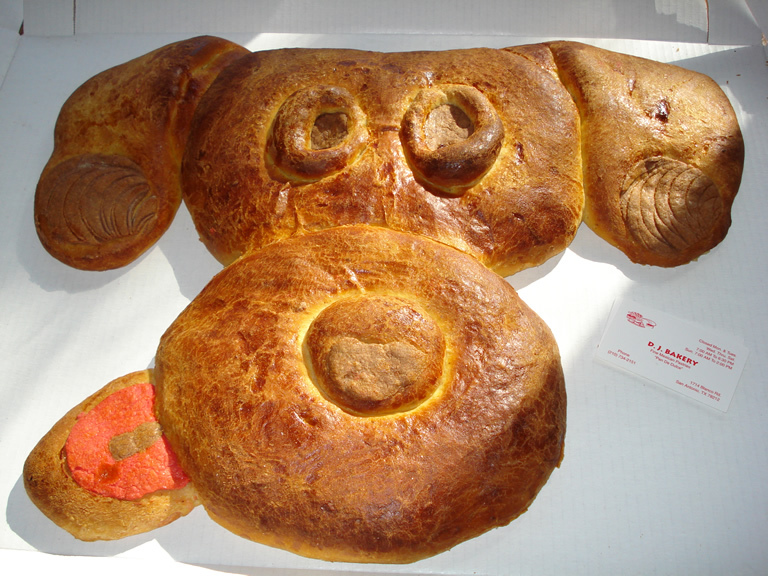 For the occasion I went to my favorite bakery and asked if they could bake a pastry in the shape of a dog head for the event (since everyone was to bring their dog). They said all we had to do was bring in a drawing or photo and they could do it. So on Saturday morning my friend and I went to pick up the pastry. We walked in and there it was sitting in a box on the counter. The woman working the counter saw us and went to get the other baker. As she went we heard her say “they’re here to pick it up!” with excitement. Turns out thet used twice the amount of dough that we had paid for, but weren’t going to make us pay for it (although we did anyway) since it was their decision to do it right.